Audrey is a stuffed bunny who is continually passed over at the toy store because of a smudge over her heart. She fears her imperfection means that no one will ever pick her. When she is finally chosen by a young girl she feels she needs to hide her imperfection so as not to be found out. Ultimately Audrey Bunny and the reader learn that we are fearfully and wonderfully made by God (Psalm 139:14) and He loves us -- imperfections and all. This book is heartwarming and beautifully illustrated. The back of the book even contains a Parent Connection page which includes additional verses, discussion questions and an activity. This book is sure to become a much loved favourite. 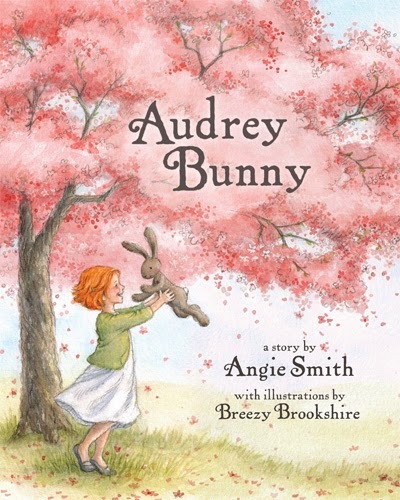 Win It: One Sowing Dandelion Seeds reader will win a copy of the hardcover book Audrey Bunny. I think this would be a great book for my grandkids! I'd love to give this to my niece for a present - she loves books! My granddaughter loves to read. We love bed time stories! my cousin would love this for an xmas gift! From the reviews I have read, this sounds like a very sweet book to read to children. I have followed Angie's blog for years and would love the chance to share this with my kids. I would love to win because this looks like a cute story to read with my niece. I love books and having many different ones to read to my son and rotate through. I'd like to win because I think my granddaughter would enjoy this book. I try to encourage her to read as much as possible. This would be a beautiful book to read with my daughters. I would like to win this book for my child. To read it to my little one at night! We love books here and we can never have enough! I want to read because it looks like a great book to read with the kids. I would like to win because I think my daughter would like this book. I would love to win this book, because it would be a great gift for my daughter and I to read together. Thanks for the giveaway! My boys would love this book. I'd read to my daughter! I would like to win this for my daughter =) She loves books and loves to read. I would like to win this for my niece. I think she would love the book. I love that it has such a great lesson. It has a great life lesson and it sounds like a cute read. My son would enjoy it. Sounds like a good book that my nephew would like. I love to give each of my kids a special book for Christmas. This would be perfect for my daughter!! I would love to win for my granddaughter, i know she would love this book. I think my daughters would love this book! I love it when my granddaughter cuddles on my lap and we read together. This book would be great to read together. My five year old daughter would absolutely adore this book! Thanks for the chances to win. I think this is a book my daughter would enjoy very much. I'd like to win this for my little grand-daughter. I would love to have this book to share with my two nieces. It would be a great addition to their Christmas gifts. I would love to win for my four girls they would love this book.